With the right setup, towing 4 wheels down is an easy way to bring along transportation once you setup your motorhome at the campground. But it's no surprise that towing a vehicle right behind your motorhome is destine to ruin the vehicles finish along with possibly doing quite a bit of damage. Just one run in the rain will have you questioning the idea of towing a $20,000 + vehicle 4 wheels down with it covered in a rocks, dirt and silt. I hate to even hit the windshield wipers on the toad once I get to our destination for fear of scratching the glass with all of the sandy silty mess plastered on the windshield. 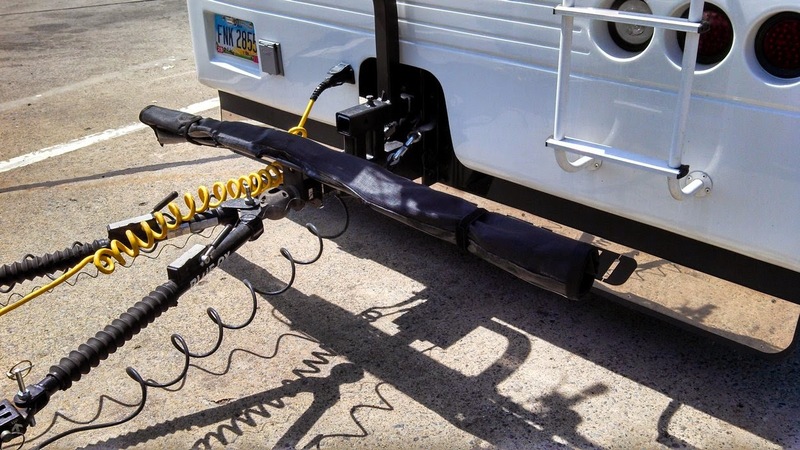 So a toad protector would be a logical accessory to add to the towing setup, but I always hated the idea because I did not want to add more time and steps to the connection process. There are some campgrounds without a good place to disconnect your toad and you find yourself holding up other campers who are trying to get to their campsite. So when Blue Ox introduced the Kargard II with it's fast setup and easy storage I was all in. Newly installed bolts with pins and clamp brackets in place. 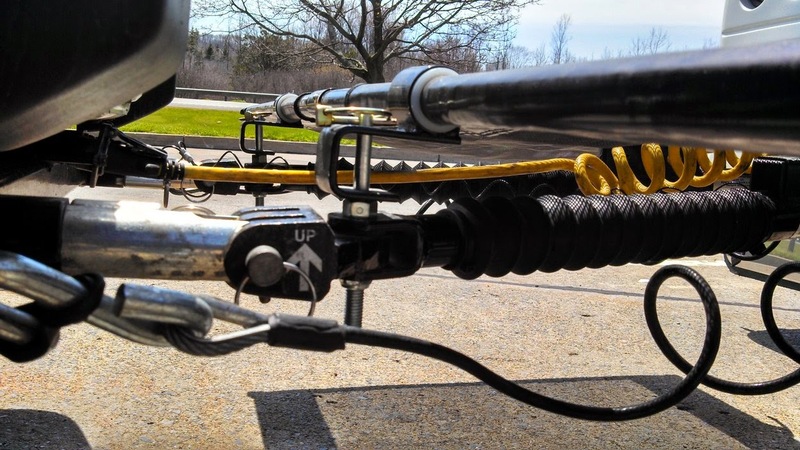 The installation is very easy, it comes assembled and slides on to the tow bar receiver tube that is inserted into your 2" hitch receiver on the motorhome. There are 2 bolts that are included to replace the bolts on the tow bar legs that connect the triple lugs. The only thing left is to adjust the Kargard II so that it's stretched out tight and tighten the 2 bolts located on the bracket that mounts to the receiver tube. My setup does not allow for the perfect fit. The very first time out with it installed we traveled over 200 miles in the ran and I noticed some added benefits to having it installed. First was that my rear camera was not getting blurred by all of the road spray like it normally does without the Kargard installed. When we got to the campground the Jeep that we tow was in far better condition than it ever had been before. By no means was it clean, but the hood and windshield were not filled with small rocks and silt like it normal would be. Also, we have had an issue with a small amount of water leaking in the doors on Jeep while being towed in a heavy rain and we had no issue with that either. And finally the back cap of the motorhome looked pretty clean and it never looked like that before. 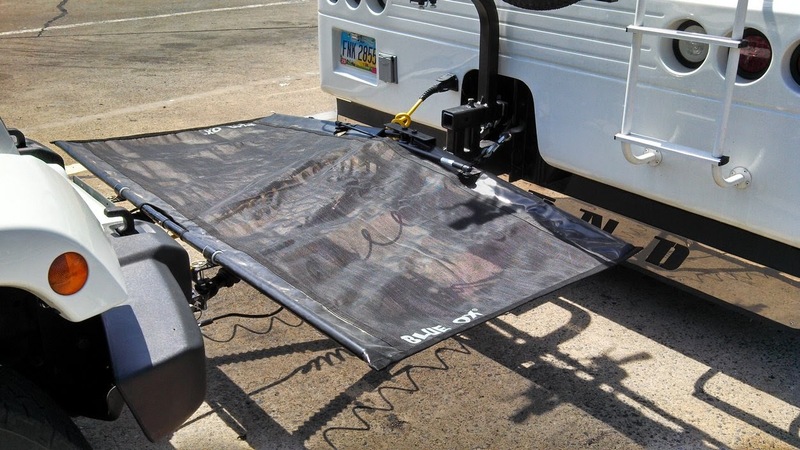 Even with my hitch being extended out (see the final photo), which allows for a pretty big gap between the motorhomes rear cap and the Kargard II, I had very little damaging dirt and road grime on the car or motorhome. 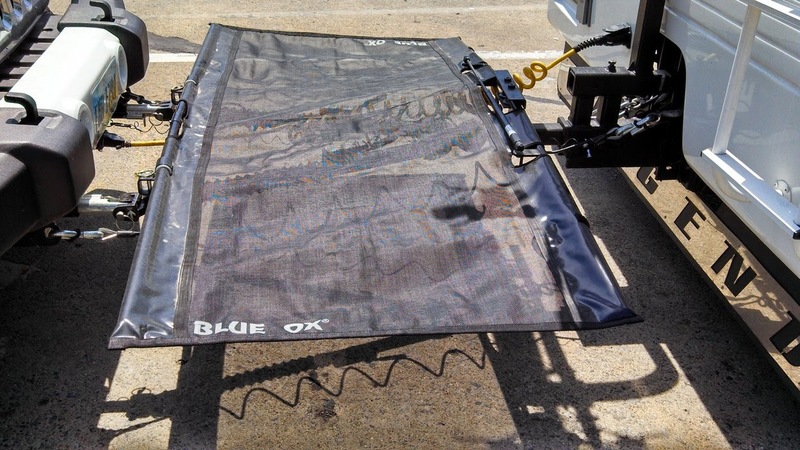 Like most all of Blue Ox's products, this is very well built, the screen material used on the Kargard seems very rugged and I don't foresee any potential issues or failure points. Viewing it in my rear-view camera I didn't notice much movement at all while under way even while it was being pummeled by a torrent of water that was being kicked up by the tires of the motorhome. I have to say I am really happy with the performance of the Blue Ox Kargard II and look forward to it's protection of our Jeep for years to come. If you have any questions or feedback, please leave a comment and I will make every attempt to answer as accurately as I can. PURCHASED THE kARGARD II AND TOWED OUR NEW JEEP GRAND CHEROKEE TO MONTANA AND BACK TO PA. IT DOES DO ALL THE THINGS LISTED ABOVE HOWEAVER FROM THE TOP OF LICENE PLATE DOWN ON FRONT OF JEEP THE PAINT LOOKS LIKE SAND BLASTED. GOING BACK TO THE OLD BLACK UGLY THING BUT IT WORKS AND NO DAMAGE TO CAR. How does it work going around sharp corners? When cornering sharply, the front corner of the towed comes within inches of the rear corner of the coach. What happens to the Kargard on the pinched side, as well as on the stretch side? On the stretched side the arm is hinged and a gas strut is used to push it back in place when you straighten out. On the pinched side the material just folds up. I have taken as sharp a corner as I probably ever will and the Kargard just did it's thing. I would imagine if your always moving forward it should never get to the point of hitting the RV. If you try and back up and are in a jack knife situation, which you should never do but sometimes there is no option, I would make sure you are monitoring your backup camera and have someone outside watching or just remove the Kargard until you are out of that situation. Its also really important to have a brake controller kit to save your life when you drive your home car or a long truck. Its purpose is to engage the trailers stopping system. As in, it shows the amount of power required to slow down the whole vehicle, help manage the car when you are arriving at a halt and the delayed time it will take for the trailer brakes to comply.